THESE ITEMS ARE BEING DISCONTINUED. Some color and size combinations are no longer available. The 3 Volt LEDs are the perfect size for miniature projects: dollhouses, dioramas, art projects, railroad scenes, and more. Power them with any of our 3V power supplies. MEGA These are very bright! The amount of light may be reduced by painting over the LED with a white/off-white craft paint. Works well to light a small area (jewelry display, small room in a dollhouse, etc.). CHIP The most popular size. Softer light than the mega size. NANO We love these for lighting very small areas. They're also great when just a small amount of ambient light is desired (place an LED behind a dollhouse window scene, for example). PICO These are incredibly tiny! They work well to light extremely small/tight areas where other lights cannot go (for example a brake light on a small model train). LEDs are much more efficient than incandescent bulbs. They don't become hot (perfect for paper projects, costuming, and places where the lights will be dangerously close to flammable and/or fragile items). They last a LONG time - 10 years/10,000 hours. It's very unlikely that you will have to tear apart your project to replace an LED. They provide a lot of light. In fact, sometimes they are brighter than is needed. Thankfully there are ways to cut down the amount of light (discussed in the LED lighting tutorial). They are tougher to break than an incandescent bulb because there isn't a filament. How are the LEDs powered? All of our 3 Volt LEDs may be operated by either a plug-in style wall adapter (1-50 chip size LEDS), a coin cell battery (1-10 chip size LEDs) or 2 AA batteries (1-30 chip size LEDs). 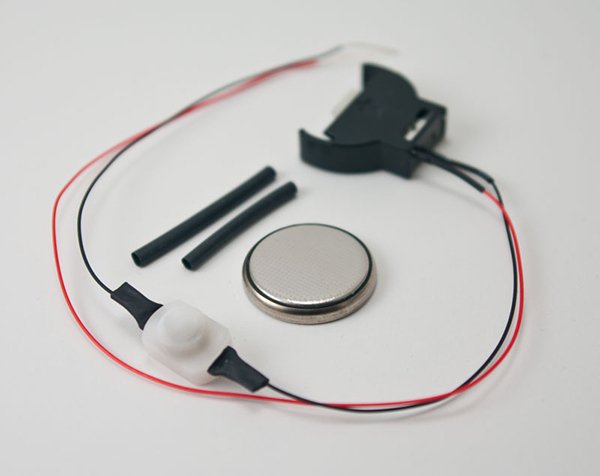 The coin cell battery and switch unit (shown at left) is the smallest battery holder. This battery holder and switch is easy to hide in a base unit, attic, under furniture, etc. Do NOT use these 3V LEDs with a standard dollhouse transformer; it will ruin the LEDs. How often will the battery need to be changed? 10 chip-size LEDs will run for about 12 hours on a coin cell battery holder. 3 chip-size LEDs will run for about 40 hours on a coin cell battery holder. One chip draws approximately 20 milliamps. How do I hook up the LEDs to a power source? It's easy! We've written a step-by-step tutorial: FREE LED wiring tutorial If you have more questions, please contact us. Do I have to solder? No. There is no need for soldering the wires. The connection may be secured with shrink tubes or black tape. How long are the wires of the LEDs? The wires are 8 inches (20cm) long. The wires on the power sources vary (see individual items for their dimensions). If a longer length of wire is required for your project, wired connectors are available. How many LEDs are needed for a project? This varies, depending upon the size of your project and how much light is required. If you would like recommendations, please contact us. Keep in mind that when working with dollhouse miniatures, we recommend using these systems to light smaller scale rooms or dollhouses (half 1:24 scale, quarter 1:48 scale, and microscale 1:144). They also work well for lighting small areas in 1" 1:12 scale dollhouses (china cabinets, under cabinet lighting, Christmas trees, fireplaces, glitter houses, etc.) We do not recommend using these to light an entire 1:12 scale dollhouse. To help you decide the quantity and size of the LEDs for your project, please contact us.